Climate-smart agriculture (CSA) tackles the challenges presented by climate change through practices in each of CSA’s three pillars: productivity, adaptation, and mitigation. Different assessment methods have been developed to prioritize and implement CSA and to analyze their synergies and trade-offs. However, in the recently published journal article researchers used the Life Cycle Assessment (LCA) method to propose a new methodological framework to evaluate agricultural and food systems taking into consideration the links between environmental and food security issues. This study was developed by researchers from the CGIAR Research Program on Climate Change, Agriculture and Food Security (CCAFS), the International Center of Tropical Agriculture (CIAT), and the French Agricultural Research and International Cooperation Organization (CIRAD). 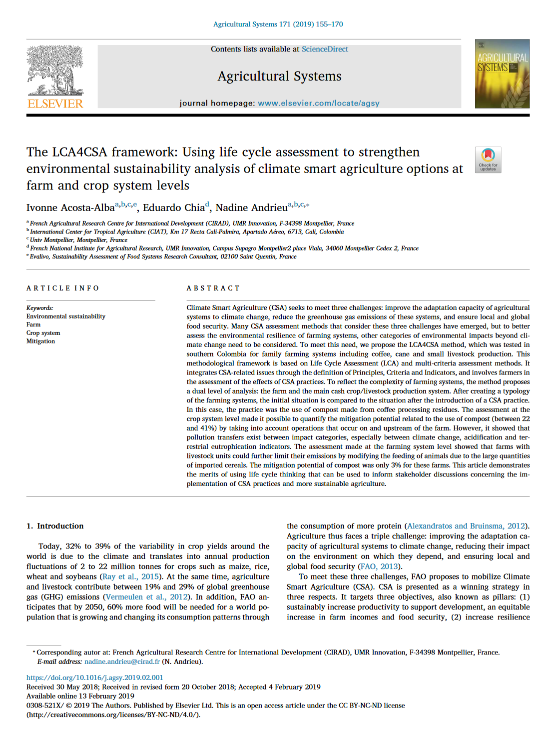 According to the authors, Life Cycle Assessment for Climate-Smart Agriculture (LCA4CSA) enables the assessment of CSA options to be strengthened by integrating life cycle thinking particularly the trade-offs and synergies between mitigation and environmental resilience. LCA4CSA allows strengthening existing assessment methods since it highlights the production stage or process that has the most weight in each impact category, for example identifying if the pollution is mainly produced on the farm or is rather linked to the transformation of agricultural products. This method “provides and assess quantitative indicators of potential environmental impacts by taking into account the fate of emissions and linking them to categories of impacts on local, regional and global ecosystems”, said Nadine Andrieu, one of the authors of the study. First Step The elements that will structure the analysis are described (the objectives of the assessment, as well as the intended audience, the contours and the function of the system). Second Step The principles, the assessment criteria and the associated indicators to be used for each are identified. Third Step An inventory, as accurate as possible, is done of all production, transportation, and processing processes; emissions to air, surface water, groundwater, and agricultural soils; and resource consumption, whether on the farm or downstream. Fourth Step A reference value for the assessment is chosen. It can be normative reference values or a relative reference. Fifth Step The results of the assessment are interpreted that makes it possible to diagnose the systems studied and identify the bottlenecks that prevent the achievement of the expected objectives. With the description of each step, researchers propose how to implement them to assess the effects of adopting CSA practices. Source: Own elaboration based on the article. The method was applied in the Climate-Smart Village (CSV) of Cauca, Colombia, showing the benefits of using LCA to assess CSA, adding a new value compared to other existing methods, since it takes into consideration all production stages “from the “cradle” to the “farm gate”, and even the “grave” if needed. This means it includes production and transportation of inputs, production on the farm, and transformation of agricultural products and their consumption. Also, it allows relating mitigation to diverse aspects of productivity (food security, yields, income). Finally, this type of methodology for assessment CSA render visible pollution transfers to avoid solving one environmental problem while creating another, for example solving mitigation but increasing problems of eutrophication. LCA4CSA is a useful holistic tool for assessing CSA: it evaluates technical options at a production system level, the complex dynamics at a farming system level, what is happening off the farm in order to perform an analysis of the synergies and trade-offs between indicators of the same pillar and between pillars. Having these different levels of analysis help to find solutions more appropriated to each case.